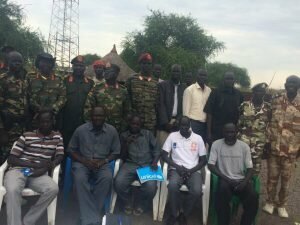 Pagak/Juba, May 13, 2017 (SSNA) — A senior military official of the Sudan People’s Liberation Army-In Opposition (SPLA-IO) has harshly criticized the recently sacked South Sudan national army (SPLA) chief of General Staff Paul Malong Awan, saying Awan departure from the helm of the national army will not change anything in the ongoing civil war. Major General Khor Chuol Giet, the Commander of the SPLA-IO 5th Division, told the South Sudan News Agency that Awan is responsible for recruiting ethnic militias who mercilessly kill civilians with impunity. “Awan is the one who recruited Mathianganyor militia group. Anyone who knows the story of this bloody-thirsty ethnic militias should not celebrate his [Awan] removal.” Giet said. Giet also proclaimed that South Sudanese President Kiir is no different from Awan, warning those who think Kiir did a good job for firing Awan are wrong. “Kiir was fully supportive of Awan’s decision to recruit tribal militiamen,” he asserted. Awan, who returned to Juba today, was sacked Tuesday. His removal caused panic in Juba as some military factions known to be loyal to him blocked roads leading to his Juba residence. Awan said today after his arrival that he returned to Juba because Kiir asked him to come back to the capital and suggested he could end up going back to his hometown to be with his family if he is not given a role to play in the government. However, one senior government official who asked for anonymity because of fear of reprisal told the South Sudan News Agency in Juba that Awan is capable of causing chaos in Juba and even overthrowing Kiir. “I wonder why Kiir wanted him back after he left Juba. But I understand the fact that the President probably realized how powerful Awan is after he sacked him on TV,” the official said. “Any position he is assigned to will be intensely monitored,” he continues. Awan was appointed in April 2014 — more than four months after the civil war broke out. This guy is a devil. He should be confined where bad people are kept. He destroyed South Sudan nation with his tribalism. He killed people as if he knows how to create them. No element of humanity can be traced in him. He thinks, lives like an animal who does not value lives of people who are innocent that make up population of South Sudan. You hopeless, how comes that you said General Malong is a devil in fact the way you think is not true please. you can forgive your enemy but if he gets chance he will not forgive you. It is okay to removed Malong. He will not lead us anymore. My general do you know that the civilian butchered by mathiang yoor are because they support you however of sudden you fold your hand to let them kill. I still credit you for been with us I know with time you will clean our tears you are among the few who are standing the course of the liberation . It breaks my heart to see what is happening in South Sudan. Evidently like South Africa u too have not got the right people in power. Merciless killing of innocent people is savage and uneccessary. SOUTH SUDANESE, MOST ARE POWER HUNGRY, LOOK AWAN, WAS ARMY CHIEF AFTER RELIEF, REBEL!! peace is the only item that we need in our country. The general remains a revolutionary (1983- 2005). He has been replaced as a chief of staff and not assigned a new role. He wants to go to his hometown – where he was born and raised; served as a governor;has a family and a farm he can cultivate crops. It is a crazy idea to keep him in Juba where he is jobless and none of his family to be with. He is a peace loving person. He never wants troubles with Government of South Sudan. He accepts to come to Juba against his will to avoid unwarranted and irresponsible confrontations​. He came to Juba, because he needs an explanation from the president, as to why he is being prevented from going home. He never insulted the president,faulted his successor or harmed anyone. Why mistrust him when he has never ever turned​ his back against the SPLM/A in history? His return to Juba is a demonstration that he loves peace. If he was irresponsible he could have defied orders and proceeded to Aweil, fighting soldiers,barricading his path but he knew such an act would have been no different from the fighting amongst presidential guards as a result of Riek Machar’s sacking which led to the current civil war. there is time for every thing. we need for reshuffles in the army. we need those at lower rank I.e col and majors to be promoted to generals coz they are more educated than those at the top. enough is for anyanya or SPLA liberators give us chance for peace. King Paul u r citizen of Awiel the best state for everything fighting, peace and smartness, we know u very well. If malong was from another tribe of south-sudan ,he woul have been killed.But because he was dinka,that is why they called him back just to briefed him. If malong was from another tribe of south-sudan ,he would have been killed.But because he was dinka,that is why they called him back just to briefed him. That Reshuffle did by president is fear to remvoe king pual from Army chief, but the accused is. why did he left with out handing the office? that meant he has planed of rebel that p’ple thinks of it. It is a routine to change king paul,but what happen now and before chief use to be reshuffle with his dupties and promote new general. If you’re not getting into jail you’re not a big politician because being politician is not simple like eating banana. Removable of malong is the beginning of peace in south Sudan. Don’t worry junubin. The likes of Awan, Kiir and key elements of Jieng who have their hand stained with innocent junubin blood, their days are numbered. If you remember during the struggle the Khartoum gov loyalities such as Samsadin who was butchering innocent junubin at the White House in Juba, the likes of Isaiah Paul plus tens of CIDs who were killing junubin in the south – they had all gone. They didn’t wait to see the birth of the newest nation on earth. You will one day recall what I said when the likes of Awan and Kiir turn again each other. You will one day recall this, when one morning Kiir weak up and realised that his betrayors are his close people and then turn against each other. The eyes of those innocent junubin who were closed inside their homes and burned alive, the eye of the innocent elderly people in unity and Jengolie states who are right now dying of hungry due to Kiir prevention of food aids distribution, the eyes of many innocent junubin who were butchered by Kiir and Awan’s militiamen will never and never rest until they see their murderers no more. Junubin please wait and see what the spirit that took the likes is Samsadin, the Isiaih and James Wani, etc will do to these people. That is correct the removal of Paul Malong Awan can’t change the subject of gennocde. Paul Malong Awan should pay dearly with his life for killing my course mate R.I.P wani i will always lay Beautiful flowers on your unforgettable grave every 14/December may the almighty keep you safe until we meet again my dear friend .